ClassicCars.com reports on the 2016 Amelia Island Concours d'Elegance which will feature Amelia's "Trophy Cars" - eleven significant competition cars and the famous trophies they won in some of history's fabled classic races." Eleven of the greatest trophies in motorsports, and the racing cars the won them, will be presented in a special class called “The Great Trophies and Cars” at the 2016 Amelia Island Concours d’Elegance in Florida in March. The Indy 500’s famed Borg-Warner Trophy, the early-era Vanderbilt Cup, two separate year trophies from the 24 Hours of Le Mans, the Harley J. Earl Daytona 500 Perpetual Trophy and the French Grand Prix trophy of 1914 will be among those tracing the history of world auto racing. Towering over them all will be the seven-foot-tall Wheeler-Schebler Trophy, first awarded at the Indianapolis Motor Speedway in 1909, the year the Speedway opened. Its last presentation was in 1932 to winning-car owner Harry Hartz, who collected his Indy 500 prize for the third straight year and donated the imposing cup to the Indianapolis Speedway Museum, where it stills awes visitors. A favorite for stock-car fans should be the Harley Earl trophy, named for the iconic General Motors designer and celebrating the most prestigious of stock car races, the Daytona 500. 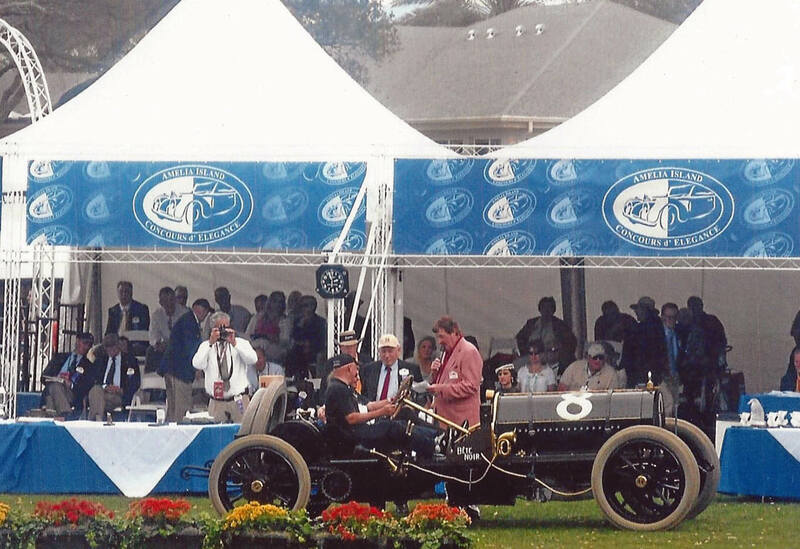 The Amelia Island showing will mark only the second time the Harley Earl and Borg-Warner trophies will be displayed together. One trophy that is rarely seen and shrouded in mystery is the Maurice G. Bauer Trophy, which was meant to award the winner of the Cannonball Run, an unsanctioned coast-to-coast race that was run four times in the 1970s. But the trophy never was awarded. When the bronze bust of Maurice Bower rendered by Bolus & Snopes was presented to Cannonball co-founder Brock Yates in 1972, he reportedly liked it so much that he decided to hang onto it and it never left his home. The 1973 Ferrari Dino that won the 1975 race, and would have taken the trophy, will be displayed at Amelia with the unawarded prize. Of Maurice Bauer, little is known aside from his watching “developments” from his front porch in Grand Island, Nebraska, according to an Amelia Island Concours news release. The 2016 Amelia Island Concours d’Elegance events will be held March 11-13 on the 10th and 18th fairways of The Golf Club of Amelia Island at The Ritz-Carlton, Amelia Island. 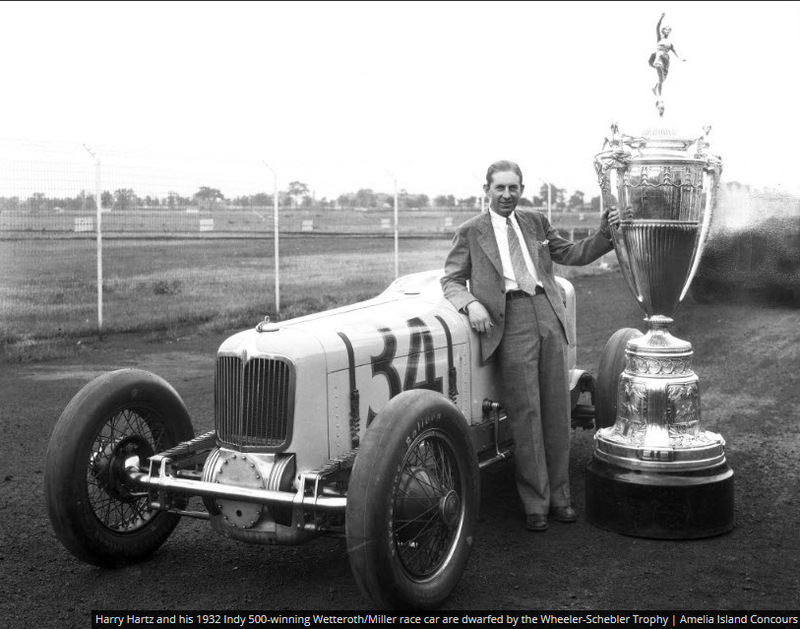 Harry Hartz and his 1932 Indy 500-winning Wetterorth/Miller race car are dwarfted by the Wheeler-Schebler Trophy. Courtesy of Amelia Island Concours. The Alco Black Beast as seen at the 2012 Amelia Island Concours d'Elegance. Photo by Ellen Limongelli. Yep, I’ll be there! Going to see the Alco again after 40 years. Have never seen the Vanderbilt Cup. How did Bill get the Smithsonian to part with for an event? He must walk on water. Michael, the Alco Black Beast will be paired with the CART Vanderbilt Cup. This cup was awarded to the winner of the U.S. 500 from 1996 to 1999 and the CART/Champ car champion from 2000 to 2007. The original Vanderbilt Cup remains in a storage locker at the Smithsonian Institution and was not made available for this event by our national museum. Why can’t our National Museum loan the actual Vanderbilt Cup with the Car that won it, for this spectacular, “once in a lifetime” opportunity to bring all these great past winners together? Doesn’t anyone have some ability to get this item loaned out for a week? How is the public ever going to the chance to appreciate this piece of automotive art, sitting in a locker in Washington D.C. ???? Isn’t this the true reason for conservation of this unique artifact?